Global leader in satellite navigation, Garmin, has announced its continued sponsorship commitment with Hamble River Sailing Club (HRSC) to remain as title sponsor of the Garmin Hamble Winter Series. This support from Garmin, which has its European headquarters at Southampton, enables HRSC to continue to invest in the UK's premier winter sailing series and ensure it offers the mix of racing and warm welcome ashore that attracts large numbers of competitors to the popular event. In 2014 more than 160 yachts took part in the Garmin Hamble Winter Series. The 2015 series and its associated events will be open to racing yachts from a number of classes including IRC 0-4, J/111, J/109, J/88, Sigma 38, J/80, J/70, SB20 and Impala 28. Chrissy Winchcombe, Marketing Executive at Garmin, said: "We are delighted to sponsor the successful Hamble Winter Series and partner with Hamble River Sailing Club throughout the year. We use the event to test and promote Garmin marine products and Garmin has enjoyed more than 10 years of successful sponsorship of the Hamble Winter Series. Trevor Pountain, Commodore, HRSC, said: "We are very pleased to welcome title sponsor Garmin back for an 11th year and are looking forward to working with them throughout 2015 and the years ahead. HRSC is very proud to run the Hamble Winter Series, now in its 34th year, and we are consistently recognised for running great racing with a broad mix of courses. Competitor footage shot on the Garmin VIRB camera we loaned them helped drive online and social media engagement to new heights. Club members and our army of volunteers work hard to ensure the event continues to go from strength to strength." The 2015 Garmin Hamble Winter Series runs from 4 October to 29 November 2015. Planning for the Series and associated One Design and the Grand Prix 'Big Boat' events is underway and all documentation will be available from the event website at www.hamblewinterseries.com. 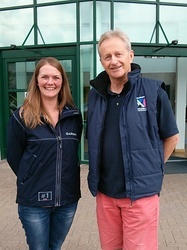 (L to R) Chrissy Winchcombe, Garmin Marketing Executive with Trevor Pountain, Commodore of Hamble River Sailing Club. This release includes forward-looking statements regarding Garmin Ltd. and its business. Such statements are based on management's current expectations.The forward-looking events and circumstances discussed in this release may not occur and actual results could differ materially as a result of known and unknown risk factors and uncertainties affecting Garmin, including, but not limited to, the risk factors listed in the Annual Report on Form 10-K for the year ended December 27, 2014, filed by Garmin with the Securities and Exchange Commission (Commission file number 0-31983).A copy of such Form 10-K is available at http://www.garmin.com/aboutGarmin/invRelations/fin... forward-looking statement can be guaranteed. Forward-looking statements speak only as of the date on which they are made and Garmin undertakes no obligation to publicly update or revise any forward-looking statement, whether as a result of new information, future events, or otherwise.